Instant quote with easy application. Lower prices because we insure small to medium-sized health clubs, which have lower risks than large fitness clubs. No requirement to join an expensive association to be eligible. Exercise Studio Program: Offers protection for U.S.-based fitness center owners and operators with less than 3000 sq. ft. of space offering individual training in Pilates, yoga, Jazzercise, aerobics, Zumba, yoga, and other fitness programs under the direct supervision of a fitness instructor or personal trainer. Circuit Training Studio Program: Protects U.S.-based owners/operators of circuit training facilities of less than 3000 sq. ft. of space. Facility must offer circuit training exercise programs exclusively. Health Club Program (Limited Services): Designed for U.S.-based health clubs with up to $500,000 in yearly sales offering programs and services that may include personal training, fitness and exercise classes, free weights, and resistance and cardio machines. Exercise studios and circuit training facilities ineligible under the first two programs because they exceed 3000 sq. ft. in space may be eligible under this program. 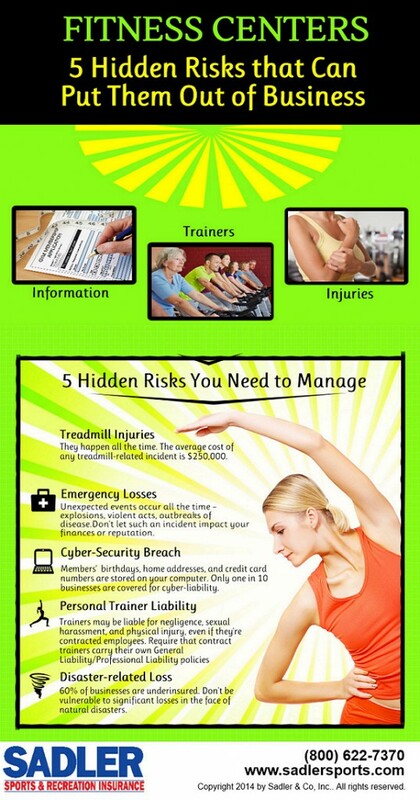 We offer free risk management material on how you and your health club employees can lower the risk of injuries and lawsuits. The best defense is a good offense: knowing what the potential risks are is the first step in avoiding them and lowering the chances of liability and paying attorney and settlement costs that can bankrupt your business. Inattention due to reading, watching TV and cell phones. Working out too hard or too soon after being inactive. Injuries from falling of a moving treadmill. This is usually a result of user error, but the injured person can file a liability claim if they didn’t receive proper instructions on using the treadmill. Slip-and-fall accidents in wet areas. Of course these usually occur in pool areas, locker rooms, saunas, and Jacuzzis. Correct placement of non-slip mats, “Wet Floor” warning signs and encouraging clients to wear non-slip footwear are critical to lowering the risk of injury claims. The most potential for risks in health clubs are in the areas of staff certification, emergency procedures, protective documentation, and the Americans with Disabilities Act. It’s imperative that health club owner/operators learn what steps they can take to be and stay in compliance in these areas to avoid liability. No matter how many precautions you and your employees take, accidents and emergencies are bound to happen. It’s critical to have written emergency procedures that are followed in the event of illness, an injury, or emergency such as a fire, tornado, or power failure. All employees, independent contractors and volunteers should receive a copy of the health club’s emergency procedure manual and be required to sign that they have read and u nderstood it. Procedures should be reviewed at least once a year. Employees who work in the fitness area should be trained in first aid. There should be at least one CPR-certified staff member on site at all times. Signs are important to client safety and help protect your business and employees from liability claims. These signs remind members of safety procedures in an effort to avoid accidents. Examples are warnings of wet floors and improper use of equipment. Warning signs should be printed professionally and strategically placed at eye level where they can be seen clearly. These range from front-desk postings about general policies to issues of cleanliness and courtesy throughout the facility. Minimum age policies, use of showers, locker rooms, and equipment and guest privileges are examples. These signs should be placed near the relevant area(s) at eye level and also be printed professionally. Mirror/glass door/widow decals are useful attention grabbers. Signs informing clients about upcoming classes and special events can be made by hand or computer and positioned where they don’t interfere with signs about safety and policy. Signs designating exits, stairways, emergency exit routes, ADA facilities and equipment, location off first aid kits, AEDs, alarms, fire extinguishers, etc. should be professionally generated and posted per building regulations. Are Waiver/Release Forms Worth the Paper They Are Written On?